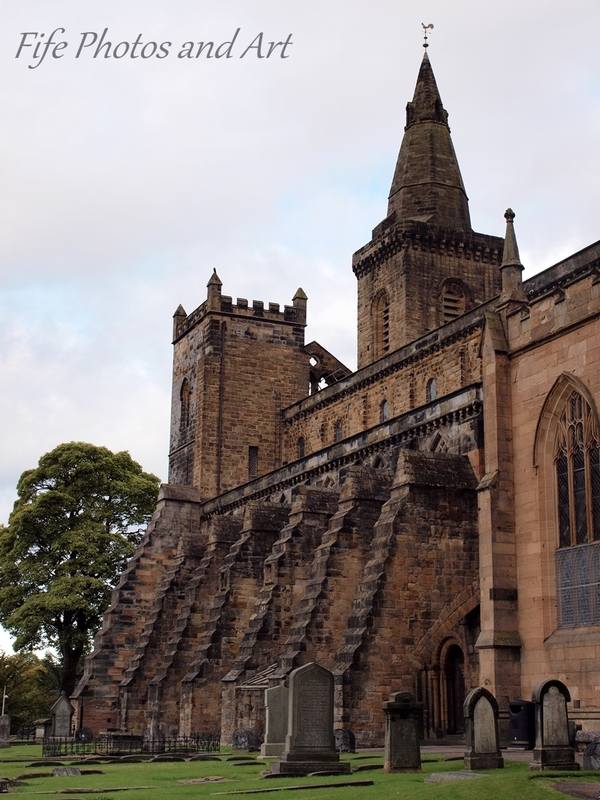 Queen Margaret, the wife of Malcolm III, set up the original church/monastery at Dunfermline in the late 11th century, by inviting monks up to Scotland from Canterbury in southern England, 450 miles south. Her son, David I, continued the development of the priory and converted it to Abbey status in 1128. 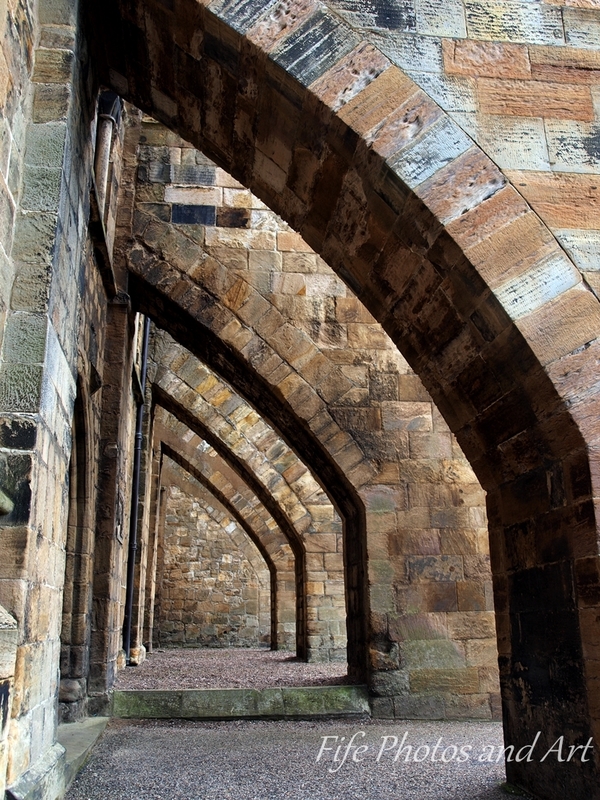 When Edward I invaded Scotland in 1303, he used Dunfermline Abbey as his winter base. He subsequently destroyed the monks living quarters when he left, but left the church untouched. Rebuilding began almost immediately, aided by Robert the Bruce (whose name can be seen around the four sides of the Abbey tower). Building continued for a further 250 years, but by the time of the Reformation in 1560, the monastic way of life was in a decided decline. 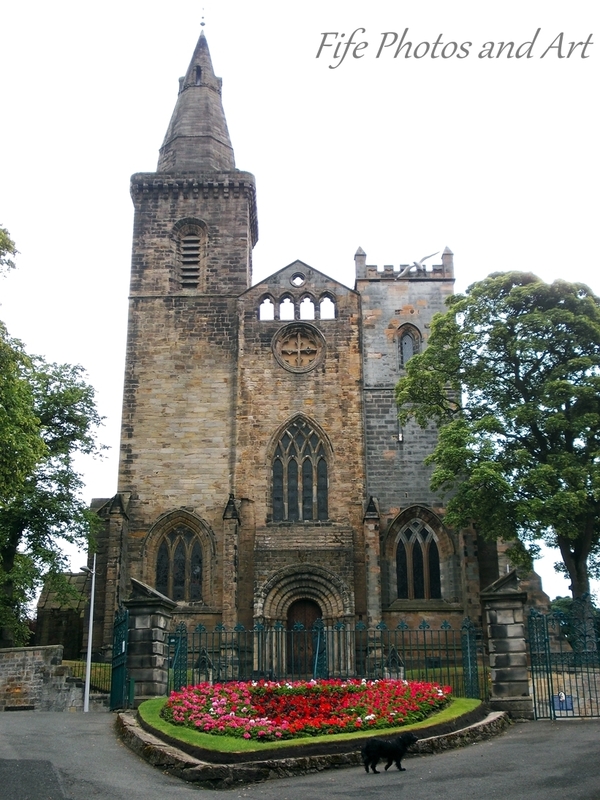 During the early days of the Reformation, much of the Abbey was sacked, but by 1570, work had already begun to create a new ‘parish church’ from the remains of Dunfermline Abbey. A new roof was added, as were the massive flying buttresses seen below. 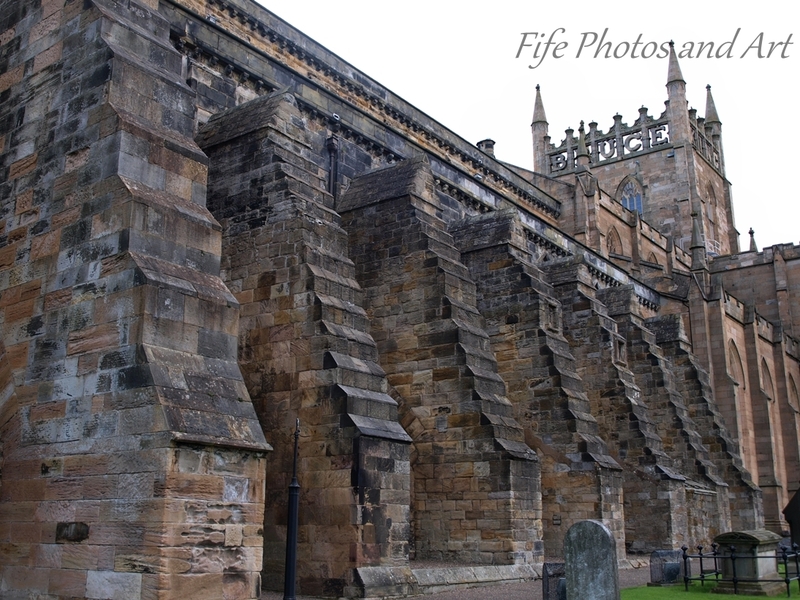 Following a conversation I had with someone on Facebook, I’ve discovered a wee bit of extra information about the top photo on this post, which shows the flying buttresses of the South wall of the Abbey. The wall facing you on this particular photo is part of the Wardlaw Crypt. Queen Anne of Denmark gave it to her chamberlain, Henry Wardlaw of Pitreavie, when it was realised that James VI and his heirs would no longer need the crypt, after inheriting the throne of England. The Wardlaw Crypt was built over the southeast door to the Abbey in 1614, but in 1903 the door was rediscovered. It was then re-opened up in 1905, thus shortening the original size of the vault. This can clearly be seen when visiting the Abbey. BTW In case anyone is interested, my Facebook Page is at https://www.facebook.com/Fife-Photos-and-Art-876703825718122/ and my profile is name Andy Baskerville. This entry was posted in Architecture, History, Weekly Photographic Challenge and tagged churches, Dunfermline, Dunfermline Abbey, Fife, Scotland, Weekly Photographic Challenge, wpc. Bookmark the permalink. That was quite interesting..the story with the pictures with the lingering thought of caution as their motivation. Lovely pics, Andy! It reminds me that I must do a post about the Abbey myself. We went there in November last year. The builders were certainly not taking any chances with those buttresses! Fantastic doorways too. Thanks Jo 🙂 Hopefully in the fairly near future I’ll do a full post on the Abbey. If it’s as good as your post, I’ll be a happy man. Did you manage to get down to Pittencrief Park at the same time? As parks go, I think it is one of the best in Scotland. No, we didn’t – I seem to remember that there’s an old tower there that I fancied looking at – but the light was going. 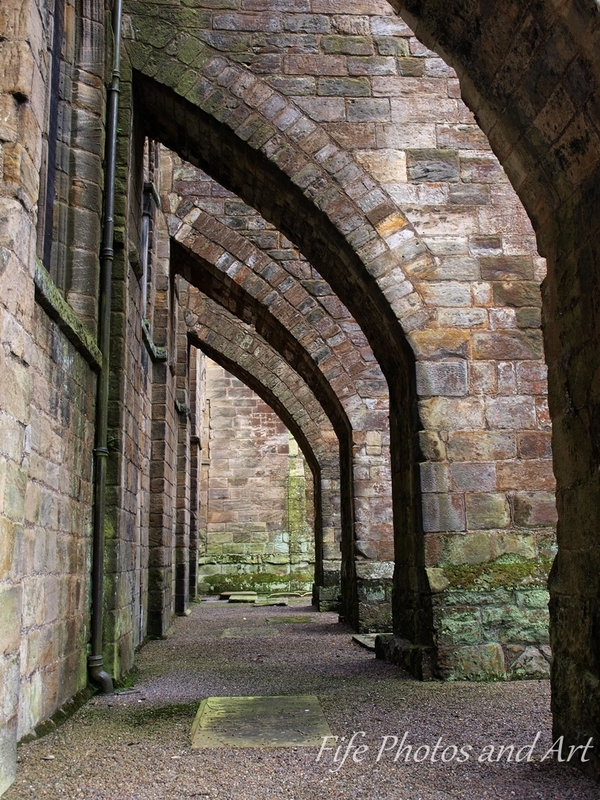 The Abbey is beautiful, though – I was awestruck by those pillars inside. There are so many parts to it, each with its own history, that I might have to write several posts! Look forward to more of your pics. It is a magnificent building, and your post brings it to life with your wonderful pictures. I love the tower with Robert the Bruce’s name on it. Thank you Lorna 🙂 Hopefully I’ll do a proper post about the Abbey and Pittencrieff Park soon. Have you been to the park? To me, it’s one of the best town parks in the UK! I agree with you, Andy, it’s a wonderful park. I used to have a flat a few minutes’ walk from Pittencrieff Park and it was one of my favourite hangouts (along with the Abbot House tearoom). I’m looking forward to your post. Amazing structures. Even the name flying buttresses is impressive. Like they are defying natural laws. They look so solid. Appropriate for the ‘careful’ challenge. Beautiful and so interesting. Yet another place I want to go but haven’t yet been in Scotland.